Check out our advice on several funding avenues worth exploring. 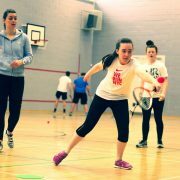 Some squash and racketball regions may be willing to contribute towards the cost of your coaching qualification, especially if you offer to provide some free coaching hours in return for the funding received (providing funding for coaches benefits the club by increasing the number of qualified squash and racketball coaches and coaching opportunities available to members). Visit Sports Coach UK to see further funding opportunities in your area. It’s also worth following their Coach Funding page on Twitter for up-to-the-minute funding info.